Danier, the Canadian mall-based leather house, have always been hit and miss for me. The stores squash over-embellished, mainstream mall garments next to occasional impeccable items. But this season they offer some undeniably elegant choices. Someone took a holiday and returned chanelling Céline. I found a small collection of such refinement and design quality that I a) pinched myself, and b) bought something. A chat with the knowledgeable store manager revealed that the exceptional items are a test of the new Black Label line, available only in certain stores– and selling madly. Here's one of the jewels, a fitted leather tee that's darted at the bust and waist, with a tiny side zip to ease at the hip (should you need it) and long-enough short sleeves, not the unkind cap. The front is melty Italian lambskin, the back a substantial techno knit. Price, $229. (Prices in $CDN, which is almost equal to $US). The s ame capsule collection includes a leather and knit sleeveless sheath (left, $299) and a sleek long-sleeved tee ($250) with leather front and back that extends to the upper bustline. At that provocative point, a barely-opaque mesh knit takes over to form a graceful neckline and is also used for the long sleeves, very Helmut Lang ($249). These pieces are of a quality priced three times as much in Paris, which is why my GF Daniele heads straight to Danier for a leather pencil skirt when she visits. There are other treasures, too: an espresso vegetable-tanned trench– shown at the top of the post– $699, soft yet substantial, well-cut and finished. 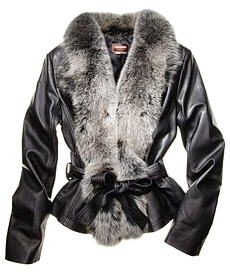 A luxurious fox-trimmed bomber, ($599), has a Thinsulate liner that makes it toasty, for a short jacket. Both the coat and jacket are sold on the web site. Stores that carry the Black Label pieces include Toronto (Eaton Centre, Sherway, Yorkdale) Vancouver (Robson Street) and Montreal (Le Carrefour Laval); look for store contact info on the web site's Store Locator. You could also try the site's Help Centre, which provides customer service by phone and e-mail. The short-sleeve tee is style #111050003. It's worth a little legwork to pick up one of those lambskin lovelies. That is good to know, as alas one's first impression of that chain can be unremitting tackiness. Céline indeed, and her equally tacky hubby René Angelil. Your Parisian friends might also like Simons, a small chain of department stores based in Quebec City. The quality varies there too, but there are some nice finds at prices far below comparable goods in Paris. On another local note, I'll check out "Ça va de soie" the silk and knitwear shop on St-Laurent in Mile End. Saw they also have a shop on Sussex Drive in Ottawa. Laval used to be hard to access without a car, but now the métro goes up there and it is very easy to get to Carrefour and Centre Laval. It is a few minutes by métro from where I live in central-northern Montréal. lagatta: When Daniele visits "here" I mean Toronto, we have no Simon's. "Cheesy" is the word I use for a lot of Danier yet I have found simple styles every year (if not every season)- one has to look. Duchesse, that black leather sheath is so sleek, it looks like something that Angelina Jolie would have worn in the movie 'SALT'. Very chic. Also, I love the fact that the jacket with the fox trim has an additional liner so that it really can be worn in cold weather. These are all classic wearable pieces. Hmmmm, I've steered clear of Danier since having some service issues with a jacket of Pater's that deserved repair response (a seam, a button). But you've given some pretty strong reasons for checking them out, soon -- I love the idea of that sheath, although the long-sleeved T might be a better compromise. What did you buy? Duchesse, as an avid reader of your blog I headed here this morning seeking advice on two items. First, I am considering the Tiffany small bean necklace as an every day piece with round neck and v-neck "t-shirts" and dresses . I thought I remembered you made a suggestion regarding small pendants on silver chains as being a bit twee for the over 50 set but I couldn't find a reference in the (many!) archives I re-read. I am also thinking of the opposite look as in a long leather necklace with an edgy smallish pendant (I haven't found one of these yet). I would appreciate your and your readers thoughts. By the time I got back to your home page I found this post on leather! Perfect (as usual)! I was thinking of a fall jacket and a Vince short leather jacket came to mind.But I often find Vince overpriced and was seeking a better quality and better price range - though with that still somewhat 'boho' vibe. I am sorry to have taken up so much space with these questions - but really I have been wondering who to ask and you and yours came to mind. Thank you! Oh, that tee looks yummy! I wish they sold online. I've found that often some really nice leather pieces can be found at lower price points (past season Talbots), and some more expensive pieces don't hold their own. It's really luck-of-the-draw sometimes. Oh I am so dying for a leather jacket this fall. I made a few exploratory stabs before summer arrived, and I will certainly be making more once it really cools down here. Of course, I won't be able to get near this label, but the inspiration is a pleasure. Thank you. Did you say what you bought? Fans are dying to know. These would be perfect for your rocker chick side--ELEGANT rocker chick, I mean. materfamilias and Frugal: I bought both the short sleeve tee (shown) and the long-sleeved tee, which is more tunic-cut. Both are so perfect, could not resist. AND I would have bought that sheath but it is too short on me (only b/c I am tall.) ma, would be amazing on you. Demi-pointe- You question deserves a post, and thanks, I love getting questions. LPC: Have you seen the Belstaff Lisa leather jacket on J, Crew? TDF, L.
I don't mind Danier; sometimes they have nice, simple leather jacket. What I mind are; the sizing is weird and the sale assistants so useless most of the time! Anonymous: Sizing is true in these, that is I am a 14 and took an XL. Good luck, maybe call first. You have to pock and choose there, but when they get it right, price is terrific. The tee and the sheath are just gorgeous and they look just perfect. Love the jacket with the fox collar too, especially the lining which makes it much more wearable for cold weather. I had a jacket, many years ago, with a hair calf front and a stretchy knit back that was really fabulous. I would think the combination would be perfection in a tee or a dress. Thank you, Duchesse. Great post. The Black Label pieces are very interesting and I can hardly wait t to see if Danier is new and improved. I live in Edmonton and the store here will special order from the line, if I can provide a number. I noted the number for the short sleeve top-do you by any chance have the item number of the long sleeved top? Also thank you for the sizing comments, I have found them to inconsistent in the past. Anon @ Edmonton: Long sleeve top is 111050001; then there is a "950" following the sku # but I am not sure you'd need it. I am XL, at size 14, in this too. The top-chest and sleeve are are a slightly lighter fabric than the s/s tee. GREAt to know; thanks, Duchesse. I've never shopped Danier before... maybe now is the time. rb: Good for you; that's why I always drop in when the seasons change. There is often something that is the exception. Thanks for this information. I would love to have a leather tee shirt. Hopefully they won't be out of stock. I haven't shopped Danier since the 80's. I have two of their jackets,and I still wear them.